I am a saver, but I do not know exactly why. For a rainy day perhaps, but rainy days are plentiful and cheap: I stay in and read something. Perhaps I save so that I can be gently fed when unable to do so in old age. More likely, perhaps I secretly wish to astound my neighbours by driving up in a red Ferrari, though rather than admiration this will more likely engender doubts about my mental state. Furthermore, I am told that only a very limited set of Ferraris hold their value. Moreover, after relaxing the rules regarding how pensions could be spent, a Government Minister agreed that pensioners “could blow the whole lot on a Lamborghini”. Decisions, decisions. Savings have survival value. Food and resources get you through lean periods. It is prudent to fear the worst and provide a buffer against storm and starvation. Surely everyone realises that? R.W. Hafer. Cross-country evidence on the link between IQ and financial development. Intelligence 55 (2016) 7-13. Research finds that individuals with higher levels of intelligence are likely to save relatively more than others. Evidence from macro-level studies shows that countries with higher than average IQs also are characterized by greater levels of saving. These two outcomes suggest the testable hypothesis: Do countries with higher national average IQs, on average, have more developed financial markets to accommodate this increased savings activity? Using three popular measures of financial development and the Lynn-Vanhanen national IQ measure, I test that hypothesis for a large sample of countries. The evidence indicates that, all else the same, IQ is a signficant predictor of financial development. The author takes 3 measures of national wealth and plots them against IQ. The bivariate correlation between IQ and Liquid Liabilities, Private Credit and Bank Assets is, respectively, 0.66, 0.76, and 0.66. Private Credit is considered the most accurate measure of savings, so I have used that one, but all three are similar. French legal systems are less conducive to wealth generation than those from other countries, such that the correlations between French legislation and wealth are negative. Hafer puts in other predictive variables, and finds they made a contribution, but not so much as to alter the conclusion that the main driver is human ability. The evidence presented here indicates that countries with higher national IQ are more likely to experience greater financial development than countries with lower levels of IQ. Using three popular measures of financial development, the effect of IQ occurs independently of a country's legal origin, its initial level of real GDP per capita and its level of economic freedom. This finding is robust to a variety of tests, including the addition of alternative institutional measures, such as human development, health, and education, as well as more specific indexes of economic freedom. Not only do individuals with higher IQs tend to be thriftier and save more, but countries comprised of such individuals apparently establish and develop financial institutions that promote such behavior. In brief, when clever people save, and when countries are composed of clever people save, then financial institutions evolve to handle those savings, and to cater for deferred expenditures. Money transfers are the first step, financial instruments like mortgages and futures markets the second. Such markets facilitate the saving habit, reduce transaction costs, speed up the re-allocation of resources, and provide deep pools of wealth to get societies through times of trouble. That is the theory anyway. The study period started in 1980 and for painfully obvious reasons stopped in 2009. The deep pools were not deep enough. Have the advanced and clever nations been clever in carrying out Quantitative Easing? I don’t think so, but as Chou En Lai remarked of the French Revolution “It is too early to tell”. (Yes, I know he misheard the question, and thought that Kissinger was asking about the effects of the then recent French Student revolution of 1968). Yesterday, at a lakeside party, Bob told me about the evening he drove up to an isolated beachside hotel in Guatemala, some four decades ago, and made his way through the deserted lobby to talk to the sole member of staff, a waiter with a skew-whiff bow tie. “Have I time to swim in the sea before dinner?” Bob asked. The waiter looked at him calmly and said “Tenemos mas tiempo que vida” (we have more Time than Life). It is curious that there should be any correlation between intelligence and longevity. The contemporary fashionable view of intelligence is that it is a creature of priviledge, a confection of schooling and private tutors, granting acess to good jobs for those who can manipulate a narrow range of logical symbols, no better grounded in real ability than the recitation of classic verse or the oratorical flourishes of rhetoric. Such hothouse flowers bloom in sheltered spaces, and have nothing else to commend them. If they live longer, it is because they dine well and sleep in feathered beds. If this is remotely true, then “correcting” for social class should cancel out any effects of upbringing and living circumstances on lifespan. To the contrary, much research (Der, Batty, & Deary, 2009; Deary, Whalley, & Starr, 2009; Gottfredson, 2004) finds that measures of intelligence taken in early childhood are good predictors of lifespan, even when social class is taken into account. The current study examined whether adolescent IQ predicted risk for mortality by the age of 32. Analyses of data from the Add Health revealed that IQ was related to mortality risk, such that respondents with relatively lower IQs were significantly more likely to experience early life mortality when compared with respondents with comparatively higher IQs. This association remained statistically significant even after controlling for a host of covariates such as race, gender, involvement in violent behaviors, levels of self-control, and poverty. The average IQ of deceased respondents was approximately 95 while the average IQ of living respondents was about 100. Persons with comparatively lower IQ scores have been found, for instance, to be more likely to engage in risky behaviors that have been shown to compromise short- and long-term health (Gottfredson & Deary, 2004). Additionally, research findings have revealed significant direct associations between IQ and a number of health outcomes, including asthma, depression, high cholesterol, and tumor growth to name just a few (Der et al., 2009). Beyond these associations with health outcomes, IQ also appears to be related to the way in which individuals respond to medical advice and directions. To illustrate, once diagnosed with a health-debilitating disorder, individuals with lower levels of intelligence are less likely to take prescription medications as instructed and are less likely to schedule follow-up appointments compared to those with higher levels of intelligence (Gottfredson & Deary, 2004). Taken together, these findings from the cognitive epidemiological literature point to IQ as one of the most important factors that is connected with overall health (Deary, 2009). Data for this study were drawn from the National Longitudinal Study of Adolescent to Adult Health (Add Health; Udry, 2003) a four-wave prospective study that was initially based on a nationally representative sample of American youth. The sampling frame consisted of all high schools with an 11th grade class and that had an enrollment of at least thirty students. A systematic random sample of these schools was then selected with the end result being the inclusion of 80 schools. The schools were stratified based on region, school type, percentage white, and urbanicity. The largest feeder school for each of these 80 schools was then selected to be included in the study. With this sampling procedure in place, there were a total of 132 schools that were retained. The first wave of data was collected in 1994–1995 when in-school surveys were administered to students who were in attendance at these middle or high schools on a specified day. In addition, an in-home component to wave 1 data was also included when 20,745 youth were selected to be re-interviewed in their homes along with their primary caregiver. The second wave of data was collected approximately 1.5 years later when 14,738 of the original respondents completed the survey instrument. Nearly seven years after the wave 1 data were originally collected, the third round of surveys were administered to 15,197 participants when the majority of the respondents were between the ages of 18 and 26 years old. The fourth and final wave of data was collected in 2008–2009when most of the 15,701 respondents were between the ages of 24 and 32 years of age and 50.5% of the sample was female. Overall, the Add Health data span approximately 14 years of human development (Harris, 2009; Harris et al., 2003). At wave 3, participants were administered the Picture Vocabulary Test (PVT), which is a shortened version of the Peabody Picture Vocabulary Test-Revised (PPVT-R). The PVT is designed to measure individual variation in verbal skills and receptive vocabulary. So, even at the early age of 32, a 5 IQ point handicap is making difference between life and death. First, and in line with existing research, there was a negative and statistically significant association between IQ scores and the odds of mortality. This significant association was detected in a bivariate rare-events binary logistic regression model as well as in the more fully specified models that accounted for the confounding effects of age, gender, race, involvement in violent behavior, levels of self-control, and poverty. Taken together, these findings suggest that lower IQ scores in adolescence are related to an increased risk of mortality in late adolescence and early adulthood. The second main finding to emerge from the analyses was that, prior to including controls for violence and self-control, African Americans were about 2.61 times more likely to have experienced death by early adulthood relative to other races. This association was expected as previous research has revealed African Americans—as a group—are at increased risk for unhealthy outcomes and premature death and that their mean life expectancy is lower than that of other races (Crimmins & Saito, 2001). What was particularly surprising about the analyses, however, was that that the influence of race was no longer statistically significant in the fully specified model that accounted not only for IQ, but also for involvement in violent behaviors and for levels of self-control. These findings converge with those focusing on other phenotypes, wherein the effects of race can be fully accounted for when including a complete list of covariates (Beaver et al., 2013; Wright et al., 2014), some of which may serve as mediators. Nonetheless, the authors are very cautious about intelligence being causal, particularly through a shared genetic pathway, though that is likely from other research. The short Peabody test was given when respondents were 18-26, which is old enough for other things to have influenced their intelligence (though this is probably not a big factor, but cannot be discounted). Moral: test intelligence early, at 4 years of age before kids go to school. That is already a very predictive score. The authors are happy with the Peabody test, saying it correlates well with other kid’s tests. I don’t question that, but I have the feeling it is insensitive for the higher ranges, so the correlations found here may be under-estimates of the real effect. Of course, happily for the subjects, few of them have died, but their good fortune makes it hard for the researchers to be sure of their findings. I am already pretty sure, because it fits in with other findings, but they, quite properly, cannot be. In my view this is another finding to strengthen Deary’s “system integrity” hypothesis. In genetic terms, whatever makes us bright makes us healthier and longer-lived. Intelligence research may seem a lonely career choice. The public understanding of intelligence has fallen so far that all and sundry have a gut-full of disparagement to offer, and not much in the way of reasoned evidence. Indeed, the capacity of fools to regard themselves as founts of wisdom was well studied by one of the four I will discuss below. Bailey studies the contributions of domain-general cognitive abilities and children’s specific mathematical skills to children’s mathematical development. Ritchie's research contributes significantly to the understanding of the causes of cognitive differences and their real-life impacts. Von Stumm innovates assessment methods in the behavioral sciences and produces original knowledge on life-span cognitive development. Woodley of Menie developed the best-supported theory in explaining positive and negative Flynn effects. So, three out of the four rising stars had already been featured in “Psychological Comments” and I will repair my apparent omission of Drew Bailey as soon as possible. Meanwhile, use their names in the search bar and the many mentions of their work will pop up for you to read. The one who looked at people’s judgements about their own intelligence? In terms of Tetlock’s superforecasters, on the narrow front of upcoming intelligence researchers I proudly claim a 75% success rate. (Long discursive meditations about predictive accuracy metrics to follow in due course). Would you be interested in attending the London Conference on Intelligence, to be held over the long weekend of 13-15 May? Speakers will include many of the researchers whose work I have covered in this blog, and will be a mixture of papers and informal discussions. It will be relatively small scale, so that there is plenty of chance for interaction and conversation. If you are interested in researching intelligence or personality, or combining intelligence measures with other research you are doing, this would be a chance to meet researchers with new things to say. The format is that we meet in central London on a Friday afternoon for a few hours of informal discussion between delegates, then a few keynote lectures, and then go off to a nearby pub for a drink and something to eat. On Saturday starting at 9 am papers are presented and discussed all day, and then in the evening we go to another pub followed by the conference dinner at an Italian restaurant. Two or three traditional toasts. On Sunday papers are presented till mid-day with a final summary session on future projects. Then we have informal end of conference lunches, sandwiches etc and more conversations. If you would like to present a paper, send a one page abstract to me for consideration. For readers, the Registration Fee is set at £20 in cash to cover tea, coffee and biscuits and room hire for the 3 days. We don’t have facilities to take credit cards. I will then send you further details. has reviewed Garett Jones’ “Hive Mind: How your nation’s IQ matters so much more than your own”. In the 1930s an Argentine friend of mine was advised by his father to learn English “because English is the language of the future, but stay here because Argentina is the country of the future”. So, with perfect English he built up the family business in Buenos Aires, and after observing the Argentinian commercial and political scene for 60 years (including his experiences as Chairman of the Anglo Argentine Chamber of Commerce during the Falklands War) he gave me his conclusions over dinner at his lakeside house: “Argentina is the country of the future, but always will be”. With this wry assessment in mind, I turned to a book written by Gustavo Semeria, from Buenos Aires "Adios a la Democracia. Un dios que para reinar devora a sus hijos". “Goodbye to Democracy, a god who reigns by devouring her children”. Semeria tells me: I'm a follower of the discoveries of Dr. Lynn in matters of intelligence and wealth generation, as well as political institutions, so I wrote this book particularly addressing the underdevelopment of Latin America, its relation with ethnic roots, culture and low intelligence, and its difficulties when trying to create stable democratic systems. It's an essay written to divulge these advances and discoveries in the psychology of intelligence. It also wants to alert people to the dangers of segregation and cultural conflicts in the region. The book is available in Spanish in digital format at http://www.amazon.com/dp/B01620YIJ0 and will be in paperback in a short time. The book has a very broad scope, and once again I stand in awe of people who write books on factual matters. The whole task must have take ages. The first part covers many issues and I only list a few: Out of Africa, a summary of intelligence research, welfare states, middle-class Burgher values; intelligence and economic progress; voting rights, education in Latin America, school choice or school vouchers, the education of elites. All this and more in what is only Part 1. Part 2 covers much on Amerindians, mestizos, racial conflicts in Latin America, immigration to Latin America, gated communities and public slums, and an overview of democratic progress in Latin American countries. Naturally, this is aimed at a Spanish speaking Latin American audience, and will bring them much about genetics and intelligence which may be new to them, particularly regarding recent intelligence research. The specifically Latin American content is of particular interest, especially that focussing on the uncertain progress of democracy in Latin America. Semeria covers historical ground when describing the clash between the Spanish Conquistadors and the indigenous natives, where the superior weapons of the invaders, and their resistance to the diseases they carried and transmitted to the natives who had no immunity resulted in those natives being overthrown and to all purposes enslaved. Friar Bartolomé de las Casas, in the middle of the 16th Century was the first to argue that the Indians were able to reason, and should therefore be treated as human beings. The conquerors had shown no such inclinations. Nordic Europeans took over North America, Mediterranean Europeans South America. Semeria points out that the Aztecs and the Incas had not achieved the same levels of development as the ancient civilizations of the fertile crescent 3500 years before. They were backward civilizations, the European Adelantados a Forward one. Semeria avers that this clash of civilizations was so profound that the effects in Latin America are felt to this day: society is stratified by racial appearance and by degree of European blood. Argentina (4.5 million Europeans) and Brazil (4 million Europeans) had a whitening policy of encouraging European immigration. Latin America has not succeeded in integrating its different races, Semeria argues. He notes, in Argentina particularly, the enormous rise of gated communities, almost exclusively white, in which the middle classes live protected by guards, paying for their own infrastructure and largely keeping to themselves. The high payments required raise the possibility that these large enclaves may, for practical purposes, be their own local governments, like Swiss Cantons, and the bigger ones will probably house up to 80,000 residents. This is hardly a prescription for social harmony, though it is an understandable reaction to the open borders which allow large scale migration from poorer and more Indian countries in South America. The book contains a grand history of the sort not much told nowadays. It is a good read, but not a quick one. The book needs an executive summary. It also needs pictures, Tables, Figures, Maps, diagrams, and more pictures, in the hope that each and every one of them will save one thousand words. The book is too long a journey for the average reader, though a persistent one will be rewarded. The section on immigration to Argentina and Brazil is good, but even that could have been improved with more graphs showing any relationship between migrant inflows and national wealth. Page 345 has one table which is powerful, showing IQ (coeficiente de inteligencia) GDP per nation, together with the European fraction of the population. This could have been analysed further, to great advantage. Other data sets, for example the recent summary of a decade of surveys on trust in Latin America (pretty low in most countries, outside immediate family members) would have been a very useful addition. America is ungovernable: those who have served the revolution have ploughed the sea. These countries will inevitably fall into the hands of the disenfranchised multitude to then fragment into small tyrannies of all colours and races, devoured by their crimes and extinguished by their own ferocity. In my view democracy has an internal contradiction, which is that votes are per head, not per contribution. Thus it is always rational for voters to favour policies which give them a bigger share of the contribution of others, thus driving collective policy towards wealth distribution or debt, or both. Does this lead the State to devour its children, or to creating a benign government, though one apt to run perpetual deficits and to postpone difficult decisions? This is a question which all democracies must ponder, but for Latin America two questions remain. Would they have done better to have imported more Europeans from Northern Europe than the Mediterranean? Can they get their europeans to create European style democracies, with equivalent levels of wealth and social benefits? Argentina is looking up at the moment, or so its harassed citizens believe, but the quality of the new government will be tested severely over the next few years. Meanwhile, the concrete pillar with the beach shower got knocked down a week ago. It snapped clean over, showing the green garden hose in the middle of the concrete. The beach chair man said that a lorry from the Municipality came and smashed it over, by mistake it was presumed, though opinions differed. Current popular estimates for its replacement run into the middle of 2017. The Municipality is bankrupt, and the new administration (right of centre) which was voted in last August cannot do anything until they receive the January local taxes. The Gorriti island lights have been turned off to save electricity, thus disappointing all walkers and diners on the Rambla. Worse, there is still no Government marijuana. They are planting some best-quality Government weed somewhere in the interior, but none of it is ready, and may indeed never be ready. Perhaps none has really been planted. No-one knows, because they are all on free-enterprise marijuana. Bolivar would not be surprised. Adam Perkins has now admitted that his claim "the higher the proportion of unemployed adults in a household, the greater the number of children - on average - that it contains" is true only if you exclude households that do not have any children. This is, I am afraid, not how you calculate an average. It is roughly equivalent to saying that Manchester City would have scored more goals than Arsenal per match this year if you don't count the matches where they failed to score any at all. He also justifies this by claiming: "the government dataset from which it is taken states that households refers to those where at least one occupant is aged 16-64 and at least one occupant is aged 0-15.". This is flatly untrue, as anyone with the remotest familiarity with household data knows. Looking at the link, to my eye the relevant description is: "Out of the 20.7 million households (where at least one member is aged 16 to 64), in April to June 2015, in the UK, 11.6 million (55.9%) were classed as working, a further 5.9 million (28.3%) were classed as mixed, and 3.3 million (15.8%) were classed as workless." In other words, the extra requirement which Adam Perkins states “and at least on occupant is aged 0-15” is not referred to in these data. As the ONS clearly states, this data covers all households, with or without children, where at least one occupant is aged 16-64. In November 2015 Palgrave Macmillan published my book ‘The Welfare Trait: how state benefits affect personality’. In it I propose an overarching account of personality and welfare, arguing that welfare policies which increase the number of children born into disadvantaged households risk proliferating dysfunctional employment-resistant personality characteristics, due to the damaging effect on personality development of exposure to childhood disadvantage. Jonathan Portes recently took to social media to dismiss the book on the basis that one particular set of government data cited in it is “wrong”. The data in question appear on page 72 of the book and are also shown below in Table 1: they suggest that there is an association between reproduction and welfare usage (the higher the proportion of unemployed adults in a household, the greater the number of children - on average - that it contains). I responded to Mr Portes’s criticism by explaining that the data in question are publically available on the website of the Office for National Statistics (ONS). Interested parties can therefore verify that the data presented in the book match the source data and are, consequently, correct (see dataset ref 002530 at the following weblink: http://www.ons.gov.uk/ons/about-ons/business-transparency/freedom-of-information/what-can-i-request/published-ad-hoc-data/labour/march-2014/index.html ). Those readers who have checked the weblink will see that the term “Households” refers to those where at least one occupant is aged 16-64 and at least one occupant is aged 0-15. This is an important point that I will return to later. 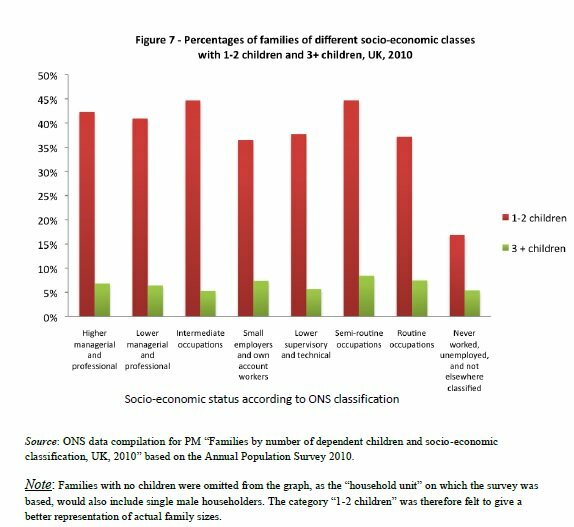 Anyhow, following my rebuttal Mr Portes conceded that the data were, after all, “correct”, but that they were “irrelevant” to my thesis on the grounds that the comparison of employment status and reproduction shown in Table 1 is only for households with children. He went on to cite ONS data that includes childless households which he claimed disprove the association seen in Table 1. Although I disagree with Mr Portes’s conclusion for various reasons that are set out below, I nevertheless applaud his willingness to discuss this issue with me here on Dr James Thompson’s website: a vigorous debate can only help advance our understanding of possible links between personality, welfare usage and reproduction. The first problem with Mr Portes’s argument is that it rests solely on census-style government data. This is a problem because these data, while benefiting from large sample sizes, suffer the drawback that they are plagued with confounds. For example, as mentioned by the commentator below, households are difficult to define. Additionally, reproduction may be prevented by physical problems that also hinder employment. This confound issue means that if we go fishing in government datasets it is easy to find seemingly impressive results that are actually spurious, because they are the product of confounds. As I mention on page 169 of The Welfare Trait, this phenomenon is best illustrated by visiting the website that mines US government datasets for significant correlations and shows just how misleading they can be (www.tylervigen.com). As an example, this scatterplot presents data from the website which suggests deaths from tangled bed sheets are linked to per capita cheese consumption: since there is no verified causal mechanism linking cheese-eating with tangling of bed sheets, this finding is spurious. The same confound problem applies to the ONS data I present in Table 1 and I acknowledge this issue on page 72 of the book. But the difference between my position and that of Mr Portes is that the ONS data I cite converges with the findings of studies that have explored causality and have been published in peer-reviewed journals, which means they have been vetted for confounds. In particular the data shown in Table 1 converge with studies from both the UK and USA that show reproduction in welfare claimants rises with benefit generosity (Argys et al., 2000; Brewer et al., 2011). Furthermore, these studies tested causation by means of follow up interviews and found that claimants adjusted fertility by changing contraceptive usage, suggesting that the association between reproduction and unemployment shown in Table 1 is likely to be causal. A second problem with Mr Portes’s argument is that he claims the focus on households with children that occurs in Table 1 is a weakness. I think it is actually a strength because it has the benefit of comparing like with like (i.e., all three categories contain households with children). This reduces some of the noise that is found in datasets that combine childless households with those that contain children. I should perhaps with hindsight have emphasised this point in the book, but it is implicit because, as has already been noted, the government dataset from which it is taken states that households refers to those where at least one occupant is aged 16-64 and at least one occupant is aged 0-15. A third problem with Mr Portes’s argument is that the link between reproduction and unemployment suggested by the data in Table 1 tallies with a mosaic of other peer-reviewed findings – cited in the book – that show a tendency for individuals with certain personality characteristics (primarily low levels of conscientiousness and agreeableness) to have more children than average individuals. Given that longitudinal studies have revealed that these same personality characteristics also raise the risk of unemployment (hence I have dubbed it the “employment-resistant” personality profile), the link between reproduction and unemployment that appears in Table 1 is a plausible addition to this mosaic of findings. In conclusion, when all these different types of data are viewed as a whole, they tell a consistent story of a connection between personality, welfare policy and reproduction that means these data in Table 1 are, by any reasonable analysis, relevant to the thesis that I present in The Welfare Trait. I am impressed that people continue writing books, an enterprise which is heroic and very possibly futile: everything moves at such a fast pace now, with new results coming out every week, whilst a book must be nursed through many months of hard labour (five and a half years in the case below), during which key research findings may be contradicted, superceded and set aside, rendering the bound volume of arguments and conclusions obsolete. The counter-balancing benefit is that in a book a thesis can be developed at its own pace, generating deeper understanding and thus having more impact than the ephemeral and nugatory postings of a blog. Adam Perkins. The Welfare Trait: How State benefits affect personality. Palgrave MacMillan 2016. 201pp. ISBN 978-1-137-55528-1. Adam Perkins is a Lecturer in the Neurobiology of Personality at Kings College, which probably means the old Institute of Psychiatry, world centre of psycho-research, where half an hour in the canteen with other researchers is better than most post-graduate courses. Perkins has put together an interesting thesis: welfare states are shaping up dependency behaviours, generating an increasing number of employment-resistant persons, who contribute very little, soak up resources, and are likely to have more surving work-shy children. My initial reaction was that although all persons respond to contingencies, I doubted that the relatively novel effects of welfarism (starting seriously in 1945, but pre-figured in 1911, and evident to some extent from 1870) was too recent to have detectable genetic impact. I decided to take a closer look. The central thesis of the book is that the benefits of a generous welfare state erode work ethics, and that the longer people live under welfarism, the more they depend on those benefits, and the more likely they are to cheat to obtain them. Dependent households have more children: for every 3% increase in UK benefits the number of children born to claimants rises by 1%, mostly due to discontinuing contraception. Perkins lays great stock on the findings of Heckman, Pinto and Savelyev 2013 that childhood disadvantage promotes anti-social behaviour. He argues that welfare dependency increases the number of children likely to be brought up badly, eroding human capital from generation to generation. Perkins, who spent quite a few years in humdrum jobs, including times in which he relied on welfare payments, drily observes that governing elites are spared the negative consequences of welfarism, and so are reluctant to deal with its shortcomings. He also notes that the current projected cap on benefits (recently postponed) is still at a level way above what the unskilled can earn in full time work, so it is to their credit that so many remain in the labour market, rather than taking the cash and staying at home. Understandably, given his job title, Perkins concentrates on personality, not intelligence. This is a drawback, because both are relevant, and inclusion of both measures would test and probably strengthen his thesis. He describes intelligence as the horsepower of the engine of the car, and personality the steering system in charge of setting desired destinations. In a nutshell, he wants the welfare system to be amended to take account of personality (I would say also of intelligence, or simply behaviour generally). It is a quibble, but Perkins believes that science is “just a refinement of everyday thinking”, and that scientific arguments are “based primarily on evidence obtained by scientific studies that have been written up and published in scientific journals or books”. I think that science is a rare, refined and detached way of thinking, restricted to cognitive elites, based on evidence regardless of publication. Eratosthenes could have muttered his calculations on the circumference of the earth to some friends over dinner, and still have been head and shoulders above most published researchers. Equally, I disagree with his quotation of Schofield 2013 “Science is not about finding the truth at all” (but the simplest explantion with predictive power). Scientists are truth-seekers. Perkins rightly draws attention to the work of WL Tonge and colleagues on 66 poor families in Sheffield, 33 of them problem families. This should have been displayed in a summary table. Problem families were more impulsive, irresponsible, apathetic and aggressive than controls. In modern jargon, less conscientious and agreeable. None of these differences were due to income or local job opportunities. Perkins also notes that the Dunedin study underlines the long term effect of low childhood self-control. In Chapter 4 Perkins looks at the influence of benefits on claimant reproduction. Low self-control is linearly related to large family size, an r rather than k strategy. Perkins sees the Hart and Ridley (1995) study as persuasive that parents, by their lack of involvement, create disadvantage in their children. However, the results are mostly due to parental levels of education, a proxy for intelligence, which the children inherit. Rindermann, H. & Baumeister, A. E. E. (2015). Parents’ SES vs. parental educational behavior and children’s development: A reanalysis of the Hart and Risley study. Learning and Individual Differences, 37, 133-138. Perkins is also positive about the Perry Pre-School project, but could have alluded to the problems of compromised randomisation, which others have sought to correct for. None of this is fatal, just incomplete. Perkins gathers together the data on selective breeding for behaviour, bringing in Broadhurst’s Maudsley Reactive rats bred for fearfulness and differing in 10 generations of strict selection; Garland’s ten mouse generations of selection for voluntary wheel running (amusingly described as the Work Ethic); and Belyaev’s selection of foxes for tameness, showing divergence in “a few generations”. The foxes were already moderately tame, so the process had a head start, and the selection was very strong, so the divergence estimates are probably too high. Indeed, the general conclusion that about 100 years of welfare legislation could significantly change human personality by genetics alone seems premature. These four generations could be the start of a trend, which is alarming enough, but many of the work-shy might have married similar persons anyway, and what welfare is doing is ensuring that their children survive, even when they cannot provide for them adequately. Inevitably, even a book published this year will have left out important new findings, which are the bread and butter of any blog. For example, Perkins quotes Turkheimer 2003 as showing that SES reduces the heritability of intelligence. I have explained why later studies, in my view, gave a more balanced picture. Perkins has raised enough matters to reveal deleterious consequences from welfarism, and to put a warning flag on non-contributory benefits, anathema to Beveridge, who saw his well-balanced ideas (contribute in order to draw on benefits only if you really need them) mutate from the safety net he had intended into a bed of benefits in which some slept all day. There are many good things in this book, many which I have marked in pencil but not mentioned since my comments are already quite long, and if I have been critical of several particulars, then that is part of my tradition: carp at even the hypotheses you believe to be basically correct. This book deserves to be read. The price needs to come down so it can reach a wider audience, but even at the current price it is worth buying and sending to your elected representative, with the key findings underlined. I have dawdled over this publication, which came out in November. Sometimes a tab remains open but leaves me suffused in lethargy, and only late in the day can I bring myself to look at it, surprised that I have left something interesting lie unattended for so long. This paper by Dicke and Roth from Bremen University is a cross-species look at what makes brains intelligent. Perhaps I feared it would upset my world picture. Many attempts have been made to correlate degrees of both animal and human intelligence with brain properties. With respect to mammals, a much-discussed trait concerns absolute and relative brain size, either uncorrected or corrected for body size. However, the correlation of both with degrees of intelligence yields large inconsistencies, because although they are regarded as the most intelligent mammals, monkeys and apes, including humans, have neither the absolutely nor the relatively largest brains. The best fit between brain traits and degrees of intelligence among mammals is reached by a combination of the number of cortical neurons, neuron packing density, interneuronal distance and axonal conduction velocity—factors that determine general information processing capacity (IPC), as reflected by general intelligence. The highest IPC is found in humans, followed by the great apes, Old World and New World monkeys. The IPC of cetaceans and elephants is much lower because of a thin cortex, low neuron packing density and low axonal conduction velocity. By contrast, corvid and psittacid birds have very small and densely packed pallial neurons and relatively many neurons, which, despite very small brain volumes, might explain their high intelligence. The evolution of a syntactical and grammatical language in humans most probably has served as an additional intelligence amplifier, which may have happened in songbirds and psittacids in a convergent manner. The authors begin with one of those cheery explanations I cherish: According to the majority of behaviourists and animal psychologists, ‘intelligence’ can be understood as mental or behavioural flexibility or the ability of an organism to solve problems occurring in its natural and social environment, culminating in the appearance of novel solutions that are not part of the animal's normal repertoire. This includes forms of associative learning and memory formation, behavioural flexibility and innovation rate, as well as abilities requiring abstract thinking, concept formation and insight. In the past, many attempts have been made to correlate intelligence with brain properties, the most influential work being Harry Jerison's book ‘Evolution of the brain and intelligence’ . A much discussed trait is absolute brain size, because many experts were convinced that absolutely bigger brains mean higher intelligence. Another much discussed trait is relative brain size, i.e. per cent of body size or the relative size of alleged ‘seats’ of intelligence like the cerebral cortex in mammals. As it becomes clear that much of brain size is determined by body size , experts have tried to determine the degree of ‘encephalization’, i.e. brain size beyond the mass related to body size, e.g. Jerison's ‘encephalization quotient (EQ)’ (for a critical overview, see ). One could also look for neurobiologically more meaningful traits like the number of neurons in the entire brain or in the pallium or cortex, the degree of connectivity, axonal conduction velocity, etc., relevant for ‘information processing capacity (IPC)’ of the brain or of the pallium or cortex, respectively . IPC is coincident with the notion of ‘general intelligence’ as largely defined by the efficiency of working memory and, accordingly, mental manipulation abilities [5–8]. Finally, one could look for ‘unique’ properties that could best explain the observed differences in intelligence in the context of ‘mosaic brain evolution’. The authors then run through brain size, encephalization, number of neurones in various brain zones, and axonal conduction velocity, using information processing capacity as the equivalent of intelligence. Brain size is mostly related to body size, and does not mean much. With increasing brain size in mammals, cortices increase in surface area as well as in volume. The smallest mammals, for example shrews, have a cortical surface (both hemispheres together) of 0.8 cm2 or less, in the rat we find 6 cm2, in the cat 83 cm2, in humans about 2400 cm2, in the elephant 6300 cm2 and in the false killer whale (Pseudorca crassidens) a maximum of 7400 cm2. Thus, from shrews to false killer whale we find a nearly 10 000-fold increase in cortical surface area, following exactly the increase in brain volume at an exponent of two-thirds, as expected . This dramatic increase in brain surface area contrasts with a moderate increase in cortical thickness, i.e. from 0.4 mm in very small shrews and mice to 3–5 mm in humans and the great apes. The large-brained whales and dolphins have surprisingly thin cortices of between 1.2 and 1.6 mm, and even the elephant, again with a very large brain, has an average cortical thickness of ‘only’ 1.9 mm . If we compare cortical volume across mammals and examine its relationship to brain size, then we recognize that the cortex grows faster than the rest of the brain, i.e. in a positive allometric fashion, with an average exponent α of about 1 in primates . This exponent is slightly higher in primates and slightly smaller, but still positive, in ungulates, whereas in whales as well as in the elephant it is below 1. This means that in the latter two animals, cortical volume, while increasing in absolute volume, decreases in relative volume in a negative allometric fashion. Our ideas are in line with two presently much discussed concepts concerning the evolution of superior cognitive abilities such as found in humans. One of these concepts may be termed ‘continuity theory’ in the sense that higher cognitive abilities of humans and their neurobiological basis result from general or ‘conserved’ evolutionary trends found in vertebrates–mammals–primates. These trends result in an increase of absolute and relative brain size, and in a proportional increase of cortical and eventually frontal cortical volume. Thus, the highest number of cortical neurons (especially those in the frontal lobe), the most efficient connectivity pattern, and consequently, the highest IPC are found in humans. Yet, according to the model developed by Hofman, the human brain lies about 20–30% below the optimum, which would be a brain of about 3500 cm3. This would be roughly twice the present human brain volume. Of course, skull size at childbirth is a limiting factor! The second concept has been named mosaic or ‘cerebrotype’ brain evolution, referring to the idea that specific rather than general changes took place during human brain evolution, particularly regarding the prefrontal cortex (PFC). The PFC is assumed to have become disproportionally large. According to the authors, an increase of white matter, i.e. the length of axonal projection and thickness of myelin sheath, between PFC and temporal cortex—including the hippocampal formation on the one hand, and PFC and striatum on the other hand—resulted in higher cognitive and executive/motor abilities. However, these two concepts are not mutually exclusive because both emphasize the strong increase in IPC during human brain evolution. The paper should be read in its entirety, but the keys points seem to be that brain size and brain relative size contribute to intelligence but fail to account for the big observed differences between species. Cortical thickness, axonal conduction and the organisation (pre-frontal) and wiring of the brain seem more promising: it is the combination of very many cortical neurons and a relatively high Information Processing Capacity that appears to make our brains very smart. Information Processing Capacity is neuronal density, distance, and conduction. By way of analogy only, computer chips become more powerful as greater numbers of transistors can be packed on a surface, connected to each other, and the results conducted to where they are needed, in the form of cables to effector mechanisms. Packing transistors is eventually limited by atoms, connections must be made which themselves restrict the space required for further transistor packing, and the conduction of outputs must be done as efficiently as possible. Some computer chips can be optimised for particular functions, like the visual production required in compuuter games. We recognized that small vertebrates on average have small brains and large animals large brains in absolute terms, and the reason for this is that brain size is determined roughly 90% by body size. Whales/dolphins and elephants have the largest brains, with weights up to 10 kg; the human brain, with an average weight of 1.35 kg, is of moderately large size. At the same time, brain size relative to body size tends to decrease with an increase in body size, resulting in the fact that small animals have relatively large and large animals relatively small brains. In shrews, brains comprise 10% or more of body volume, while in the largest mammal (and extant animal), the blue whale, the brain occupies less than 0.01% of the body. In this context, the 2% for the human brain is very high given the fact that Homo sapiens belongs to the larger mammals. This becomes evident when we calculate the EQ or residuals of brain–body regression, which, for a given taxon, indicates how much the actual brain size of a species deviates from the average BBR in this taxon. It turns out that humans have a brain that is roughly eight times larger than expected from average mammalian BBR, closely followed by some dolphins, which have a fivefold larger brain than expected. There is no clear correlation between absolute or relative brain size and intelligence. Assuming that absolute brain size is decisive for intelligence, then whales or elephants should be more intelligent than humans, and horses more intelligent than chimpanzees, which definitely is not the case. If it were relative brain size that counted for intelligence, then shrews should be the most intelligent mammals, which nobody believes. If we take the EQ into account, some inconsistencies are removed; then humans are on top, but many other inconsistencies remain, for example that gorillas have a rather low EQ, but are considered highly intelligent, while capuchin monkeys and dolphins have unusually high EQs, but are not considered to be as intelligent as gorillas. Thus, other factors have to be considered. The cerebral cortex is considered the ‘seat’ of intelligence and mind in mammals. During their evolution, there was a dramatic increase in cortical surface area with increasing brain size, while the thickness of the cortex increases only slightly. Among large-brained mammals, primates have the thickest cortices of 3–5 mm, while those of cetaceans and the elephant are surprisingly thin (1–1.8 mm). With increasing cortical volume, Neurone Packing Density usually decreases, but primates have unusually high and cetaceans and elephants unusually low packing densities. All this sums up to the fact that the human brain has the largest number of cortical neurons (about 15 billion), despite the fact that the human brain and cortex are much smaller in size than those of cetaceans and elephants (with 10–12 billion or even fewer cortical neurons). However, this alone cannot explain the superiority of primate—including human—intelligence. Here, differences in the speed of intracortical information processing come into play. We have reason to assume that in primates in general and in apes and humans in particular cortical information processing is much faster than that in the large-brained elephants and cetaceans. Of course, the speed of information processing probably is faster in much smaller brains with still much higher Neurone Packing Densities, but these brains still have much fewer neurons. Thus, it is the combination of very many cortical neurons and a relatively high Information Processing Capacity that appears to make our brains very smart. Despite intense search, no anatomical or physiological properties have been identified so far that would distinguish qualitatively the human brain from other mammalian or in general animal brains, except perhaps Broca's speech area. All properties mentioned so far are quantitative in nature. However, human language may represent a qualitative step. Certainly, the evolution of a syntactical–grammatical language was a complicated event that included substantial modifications of the vocal apparatus, the evolution or further elaboration of the Broca speech centre as an important cognitive–executive link between dorsal prefrontal regions and motor control of the vocal apparatus, and finally a new pattern of connectivity between the posterior, Wernicke, speech centre and the anterior Broca speech centre. One can speculate that the type of intelligence found at the level of the great apes and the direct ancestors of modern humans was strongly amplified by syntactical–grammatical language in modern humans, which is assumed to have evolved 80 000–160 000 years ago paralleling the earliest archeological evidence of symbolic culture. The evolution of bird song may represent a convergent evolutionary event. The question remains why corvids and parrots, with absolutely small brains compared with those of most mammals including primates, reveal such a high intelligence. Presumably, because of extremely high packing density of neurons, they have an unusually high number of pallial neurons (upper surface of the cerebrum), probably several hundred millions, despite the small size of their brains. This could result in a very high Information Processing Capacity. Most astonishing is the fact that the ‘seat’ of avian intelligence, the nidopallium (centre of executive functions), exhibits an anatomy and a cytoarchitecture that differ considerably from that of the mammalian isocortex. This could indicate that high intelligence can be realized by very different neuronal architectures. So, brains can have somewhat different ways of being brainy, which avoids too much species egotism. Dicke and Roth have written a “Grand Sweep” paper, or Gesamtkunstwerk, which is well worth reading. It is a curious twist of fate that just as the M3 motorway out of London to the South West is being converted from its formerly perfectly functional state to a “Smart Motorway”, an international team have identified two gene motorways, including an 150 gene long M3 which seems to have an important role to play in cognitive ability. The long list of authors seems to include one or two whose deep knowlegde of the actual motorway matches my own, and their calling the convergent gene network the M3 is ironic, since the smarter the constructors try to make the motorway, the more impassable it gets. Of course, in the case of the brain,nature got there first, and did a much better job, so the gene network M3 seems to run very well. Genetic determinants of cognition are poorly characterized, and their relationship to genes that confer risk for neurodevelopmental disease is unclear. Here we performed a systems-level analysis of genome-wide gene expression data to infer gene-regulatory networks conserved across species and brain regions. Two of these networks, M1 and M3, showed replicable enrichment for common genetic variants underlying healthy human cognitive abilities, including memory. Using exome sequence data from 6,871 trios, we found that M3 genes were also enriched for mutations ascertained from patients with neurodevelopmental disease generally, and intellectual disability and epileptic encephalopathy in particular. M3 consists of 150 genes whose expression is tightly developmentally regulated, but which are collectively poorly annotated for known functional pathways. These results illustrate how systems-level analyses can reveal previously unappreciated relationships between neurodevelopmental disease–associated genes in the developed human brain, and provide empirical support for a convergent gene-regulatory network influencing cognition and neurodevelopmental disease. Unusually, I am going to quote the opening paragraphs verbatim, because they serve as a very brief introduction to the entire field. Cognition refers to human mental abilities such as memory, attention, processing speed, reasoning and executive function. Performance on cognitive tasks varies between individuals, and is highly heritable1 and polygenic. To date, however, progress in identifying molecular genetic contributions to healthy human cognitive abilities has been limited. A distinction can be made between cognitive domains such as the ability to apply acquired knowledge and learned skills (so-called crystallized abilities), and fluid cognitive abilities such as the capacity to establish new memories, reason in novel situations or perform cognitive tasks accurately and quickly. Within individuals, performance on different measures of cognitive ability tends to be positively correlated such that people who do well in one domain, such as memory, tend to do well in other domains. Seemingly disparate domains of cognitive ability also show high levels of genetic correlation in twin studies, typically in excess of 0.6, and analyses using genomewide similarity between unrelated individuals (genome-wide complex trait analysis) has also demonstrated substantial genetic correlation between diverse cognitive and learning abilities. These studies suggest genes that influence human cognition may exert pleiotropic effects across diverse cognitive domains, such that genes regulating one cognitive ability might influence other cognitive abilities. As impairment of cognitive function is a core clinical feature of many neurodevelopmental diseases including schizophrenia, autism, epilepsy and intellectual disability (by definition), we sought to investigate gene-regulatory networks for human cognition and to determine their relationship to neurodevelopmental disease. The authors have used a fascinating, and to me very complex technique: Gene coexpression network analysis. This is based on taking, in this case, 122 frozen swhole human hippocampus surgical samples and showing the clustering of coexpressed genes (modules). To use my motorway example, it would be like looking at the way in which bulldozers and cement mixers had been built and utilised to construct many motorways, and to distinguish that from the way those tools had been utilized in building other objects. In that way one determines the plan for the building of motorways, necessarily involving the network of associations which are the essence of the construction plan. Having made corrections for those patients with epilepsy, of the four modules conserved in healthy hippocampi across species (M1, M3, M11 and M19), only M1 (n = 1,148 genes) and M3 (n = 150 genes) were enriched for functional categories explicitly related to synaptic processes. These 4 cross-species “motorways” were then tested on cognitive data from human subjects in two cohorts of cognitively healthy subjects, using 6732 subjects to discover any associations, and another 1003 subjects from anther cohort to test them. In other words, they have not followed the usual psychological publication pattern, in which the authors discover an association, publish it, and ask others to replicate it (knowing that they probably will find it difficult to do so). In Psychology this gives authors a publication which become famous, is frequently quoted, and takes on a life of its own even when years later an eventual repication fails to confirm the original results. Here we have psychologists and geneticists measuring the replicability of their finding in one paper. We observed that module M3 was strongly and specifically enriched for genes that, when mutated, are associated with intellectual disability and epileptic encephalopathy, and that this enrichment holds true for both pdDNM intellectual disability; epileptic encephalopathy; and all nsDNM intellectual disability. Using a stepwise procedure we prioritized gene networks whose gene coexpression relationships were significantly reproducible across brain regions and species to facilitate the identification of functionally conserved and replicable networks. We demonstrated replicable association between two of these coexpression networks (M1 and M3) and healthy human cognitive abilities. As M1 is functionally enriched for genes involved in synaptic processes, these findings provide systems-level evidence for a relationship between long-term potentiation and postsynaptic processes and human cognition, as previously suggested by an analysis of known postsynaptic signaling complexes5. In contrast to the functional specialization of M1, M3 is relatively poorly annotated for known functional categories or canonical pathways and our study revealed previously unappreciated coexpression relationships between genes influencing cognitive abilities. The finding that M1 and M3 influence cognitive abilities generally (as opposed to influencing specific cognitive domains such as memory) is in agreement with the evidence from twin and genome-wide complex trait analysis demonstrating high genetic correlation between diverse cognitive and learning abilities9,10,48. The widespread expression and coexpression of M1 and M3 genes across the human cortex, and their tight developmental regulation, is also consistent with these modules playing a role across cognitive domains. The genes in M1 and M3 are stable through the life course. When considering common risk variants (that is, SNPs) for neuropsychiatric disease, we observed an association between M3 and schizophrenia but not with common forms of epilepsy. In sum, this is a novel approach, and one which is likely to launch further searches for convergent gene networks. I had imagined that the new approaches would be looking at some theory of protein formation, and had not understood that particular brain regions might offer important clues. Looking at the revealed associations, in terms of clinical implications, it confirms the link between schizophrenia and cognitive decline, and may eventually explain how problems with networks are an important part of the cause of such decline. And now, back to the actual M3 motorway, which will continue to be blocked for most of this year, the most noxious experiment in raising the IQ of a motorway ever suffered by motorists.